Western Washington continues to grow as a popular retirement location. Baby Boomers have been flocking to this region for its scenery, setting and welcoming atmosphere. 55+ residents love the copious outdoor recreation with access to mountain ranges and the ocean. Western Washington has many desirable 55+ active adult communities that are sure to satisfy your needs and wants. Western Washington is the region west of the Cascade Mountains along the Pacific Ocean. This region has over 24,000 square feet of land and is made up of nineteen different counties. 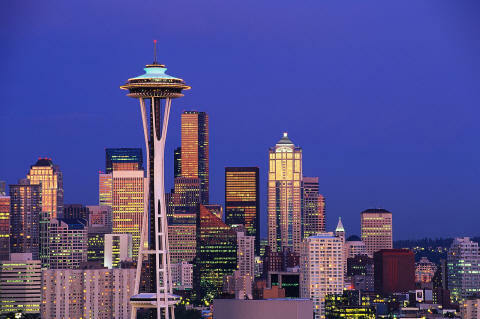 It is also home to Seattle, the state's largest city also known as Queen City or Emerald City. Western Washington's climate is classified as marine west coast with mild and wet winters and cool and dry summers. This area is known for being wetter and more moderate than Eastern Washington, due to the rain shadow of the Cascade Mountains. This area has 168 days of precipitation with heavy snowfall in the mountains, and less in lower elevations. Active adults and retirees love living in Western Washington for its natural beauty, strong cultural influences and recreational activities. The area hosts many festivals, fairs, and farmers markets including the Tacoma Film Festival and Daffodil Parade. Popular attractions include Tolmie State Park, Pike s Place Market, The Fremont Troll, Gas Works Park, Olympic National Park, Fort Worden State Park, San Juan Islands, and Mount St. Helens Ape Caves. Retirees and 55+ active adults appreciate the fact that Seattle has been a regional center for the performing arts. It is home to many well-known organizations including the Seattle Symphony Orchestra, Seattle Opera, Pacific Northwest Ballet and the Seattle Youth Symphony Orchestras. Tacoma is also home to many popular cultural attractions such as the Museum of Glass, America s Car Museum, Tacoma Art Museum, Washington State History Museum, and the Broadway Center for Performing Arts. There is an abundance of outdoor recreation and parks in the surrounding area for Western Washington's active adult residents to enjoy. 55+ residents and retirees love participating in hiking, biking, skiing, kayaking, snowboarding, sailing, and much more. This area is also home to many sports teams including the Seattle Seahawks, Seattle Mariners, Seattle Storm, Tacoma Rainiers, Tacoma Tide, and Tacoma Cobras to name a few. Western Washington is the ideal retirement location that offers something for everyone. Overall the cost of living in Washington is higher than the national average. This is largely due to housing costs, especially in Seattle. However, some of the best-ranked places to live in Washington are Seattle s suburbs. 55+ residents and retirees appreciate the fact that there is a property tax exemption for those whose household income is $35,000 or less. There is also a 7 to 9.5 percent sales tax that varies by location. Washington is one of the healthiest states and is home to many top-notch medical facilities. There are a wide variety of medical institutions some of which include University of Washington Medical Center, Evergreen Health Medical Center, Harborview Medical Center, Tacoma General Hospital and Stevens Healthcare. Retirees and active adults appreciate the fact that Western Washington takes healthcare seriously.